Collection Note from Bill: I was excited to purchase this beautiful print in Japan recently as part of a fine, pristine Chikanobu collection sourced from a Japanese collector in the countryside. The prints are all beautifully printed, retain 100% of their original color, are not backed, and were stored in perfect condition. They’re a nice opportunity to collect flawless prints from Chikanobu’s popular "Snow, Moon, Flowers" series. Yamashiro, Snow at the Imperial Palace, Lady Sei Shonagon, No. 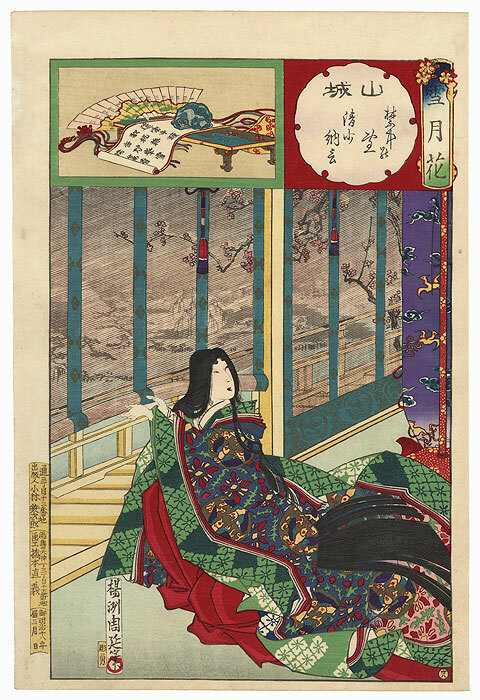 38 - Lovely portrait of the poet Sei Shonagon at the Imperial Palace. The well-known tenth-century poet was invited to the royal court by Empress Teishi, who appreciated her wit and clever observations. 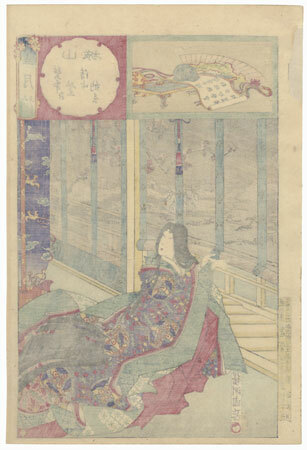 She is shown lifting the fine bamboo blinds enclosing the verandah for a closer view of the plum blossoms. She wears a beautiful formal kimono, her long hair flowing down over her back. The inset above features a writing desk holding a scroll with a poem about snow. 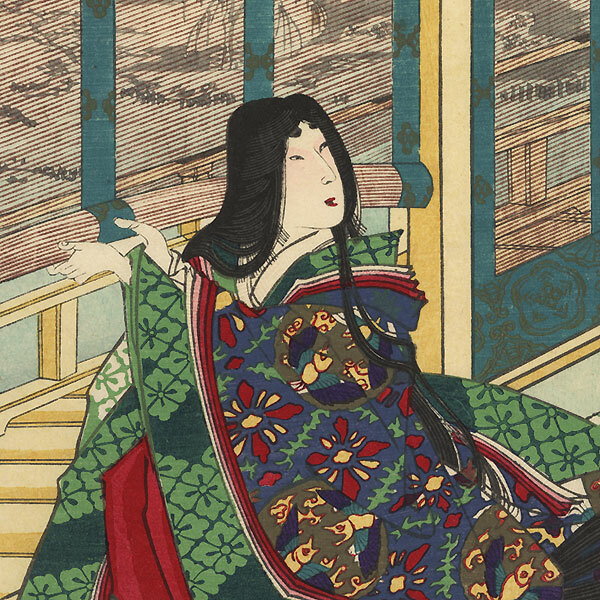 A beautiful Chikanobu design. Condition - This print with excellent color and detail as shown. Small loss at edge, repaired. A few spots. Please see photos for details. Nice overall.